In 1966 Bylaw 1161 was repealed and replaced with Bylaw 2823, creating the Edmonton Historical Board, with almost identical roles and responsibilities to the City of Edmonton Archives and Landmarks Committee. It served in an advisory role to discover, select, index, catalogue and prepare for safe keeping, reference and suitable display all books, charts, maps, papers, photographs, paintings, property, chattels or objects of any description relating to the history, alteration and development of the City of Edmonton, including recommending purchases, housing and displaying of such material. The Archives Policy was approved by City Council on April 5, 1971. It formally established the City Archives under the jurisdiction of the Parks and Recreation Department. The Archives’ objectives included acquiring, preserving, and making accessible records relating to the history of Edmonton, particularly those records relating to business conducted by the City of Edmonton. The Archives was also charged with increasing public interest and knowledge of Edmonton’s history through exhibition and displays. Archives staff worked closely with members of the Edmonton Historical Board, as well as staff at the Artifacts Centre, John Walter Museum, and Fort Edmonton Park. 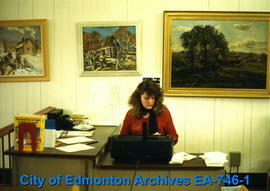 This subseries contains records created through the operation of the City of Edmonton Archives. This subseries also includes photos taken by Archives staff of buildings related to Edmonton’s history, the Archives facilities and staff, and photographs of Paul Kane sketches taken at the Edmonton Art Gallery. These records were transferred to the City of Edmonton Archives collection between 1969 and 1997 by staff at the City of Edmonton Archives. The material was arranged according to the filing system of the creator. The photographs in this subseries were arranged in no particular order and assigned item numbers with the prefixes EA-20, EA-155, and EA-746. All transitory correspondence, including research inquiries, were destroyed. Most personnel records were destroyed. Only aggregates of monthly reports were kept. Preservation copies of newspaper clippings and thermos-fax paper were made during processing.